Lila (Hinduism) (Sanskrit: लीला, IAST līlā) or Leela, like many Sanskrit words, cannot be literally translated to English but can be loosely translated as "play" (noun). It is common to both non-dualistic and dualistic philosophical schools, but has a markedly different significance in each. Within non-dualism, Lila is a way of describing all reality, including the cosmos, as the outcome of creative play by the divine absolute (Brahman). Mother and child intimacy - V.S. Apte: The noun lila means anything from sport, dalliance, play to any languid or amorous gesture in a woman. The noun lila means anything from sport, dalliance, play to any languid or amorous gesture in a woman. The slow self-manifesting birth of God in Matter is the purpose of the terrestrial Lila. All exists here, no doubt, for the delight of existence, all is a game or Lila; but a game too carries within itself an object to be accomplished and without the fulfillment of that object would have no completeness of significance. The world, as God has made it, is not a rigid exercise in logic but, like a strain of music, an infinite harmony of many diversities, and his own existence, being free and absolute, cannot be logically defined...Maya is one realisation, an important one which Shankara overstressed because it was most vivid to his own experience. For yourself leave the word for subordinate use and fix rather on the idea of Lila, a deeper and more penetrating word than Maya. Lila includes the idea of Maya and exceeds it. Brahman is full of all perfections. And to say that Brahman has some purpose in creating the world will mean that it wants to attain through the process of creation something which it has not. And that is impossible. Hence, there can be no purpose of Brahman in creating the world. The world is a mere spontaneous creation of Brahman. It is a Lila, or sport, of Brahman. It is created out of Bliss, by Bliss and for Bliss. Lila indicates a spontaneous sportive activity of Brahman as distinguished from a self-conscious volitional effort. The concept of Lila signifies freedom as distinguished from a [w:Self-conscious|self-conscious]] volitional effort. The gods themselves had come down and taken birth as men; and when you think of all that took place throughout the wonderful childhood of the Lila of Sri Krishna, you must remember that those who played that act of the drama were the ordinary men, no ordinary women; they were the Protectors of the worlds incarnated as cowherds around Him. And the Gopis, the graceful wives of the shepherds, they were the Rishis of ancient days, who by devotion to Vishnu had gained the blessing of being incarnated as Gopis, in order that they might surround His childhood, and pour out their love at the tiny feet of the boy they saw as boy, of the God they worshipped as supreme. What but an unclean mind can see aught that is impure in the child [Krishna] dancing there as lover and beloved? It is as though He looked forward down the ages and saw what later would be said, and it is as though He kept the child form in the Lila, in order that He might breathe harmlessly into men’s blind unclean hearts the lesson that He would fain give. Gautam Dasgupta:This eternal lila is the eternal truth, and, therefore, its this eternal lila - the playful love-making of Radha and Krishna, which the Vaishnava poets desired to enjoy. If we analyse and this peep into the divine lila is the highest spiritual gain which poets could think of. This eternal lila is the eternal truth, and, therefore, its this eternal lila - the playful love-making of Radha and Krishna, which the Vaishnava poets desired to enjoy. If we analyse the Gitagovinda of Jayadeva we shall find not even a single statement which shows the poet's desire to have union with Krishna as Radha had,- he only sings praises the lila of Radha and Krishna and hankers after a chance just to have peep into the divine lila, and this peep into the divine lila is the highest spiritual gain which poets could think of. Kartik]] with rasa lila episodes. Participants in Kartik puja, the Hindu woman perform on the banks of the Ganges River throughout the month, consider it to be a version of the rasa lila transfigured into a form appropriate for human woman, and enacted each year in celebration of the earthly rasa lila of ancient times. Therefore, it is that Hinduism calls it all His sport — Lila, or calls it an illusion— Maya. ...to be vigorously and devotedly involved in the Ramlila for one month is to take an excursion out of ordinary space and time. The Ramcharitmanas, along with mainstream devotional Hinduism, teaches that the universe is lila, or play, which in Sanskrit as in English means both “drama” and “game.” The idea of lila is closely akin to that of maya, which we may say here refers to the transient and illusory world of forms. I believe that the Ramlila is constructed in such a way as to produce an actual experience of the world as lila or maya. Maya and Lila answer the questions ‘how’ and ‘why’ with regard to the world. To the question ‘why’ creation? The answer is ‘Lila’ and to the question ‘How creation’ the answer is through Maya. Although these apparently look alike Vedantic answers to these questions, Sri Aurobindoconceives them not exactly in the Vedanta’s way but in his own way. 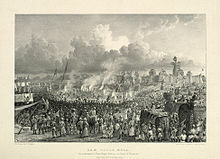 Ram Lila held in 1834 at Ramnagar. The Ram Lila at Ramnagar, the fort that is home to the kings of Benares, is the most famous and traditional of all these Ram Lilas. The Ramnagar Ram Lila began because of the royal family's patronage, and the annual performance is still the oldest, most traditional and most important Ram Lila in Benares. Clearly not reserved strictly for the spiritual, lila is nevertheless employed as a justification for the mystery of existence in various Indian religions. Depending on the spiritual system claiming the term, lila denotes a specific Divine Play whose nature corresponds to the fundamental epistemological and spiritual beliefs of the tradition in question. Thus the tenor of the definition of lila provides a unique vantage point for any spiritual tradition that utilizes the term. Nostradamus:This creative activity of the Divine is called lila, the play of God, and the world is seen as the stage of the divine play. This creative activity of the Divine is called lila, the play of God, and the world is seen as the stage of the divine play. The expansion (i.e. projection) and the contraction (i.e. dissolution) of the universe are called lila (the divine sport) in Hindu scriptures. In this divine play, the One becomes many and the many return into the One in endless rhythmic fashion. For all this diversity, the core of East Indian spirituality is Hinduism, especially as disclosed in the notion of leela (also spelled lila), or play. The entire cosmos is a leela, a dance of energy, a drama staged by Brahman, the Absolute. Leelas are also specific celebrations. This page was last edited on 24 April 2018, at 18:39.